Amazon World’s number one e-commerce website, just like last year, now again this year 2016 they have come up with Amazon Great Indian Sale from 8 -10 August 2016. Be ready for 72 hours non-stop loot deals, New offers in every 30 minutes + extra cashback if you have CITI bank cards. Enjoy huge savings on mobiles, tablets, laptops, clothing, footwear, jewellery, accessories,kitchen, tvs, gift cards, furniture and home décor, electronics and more. All you bargain hunters now have a hint where to go. 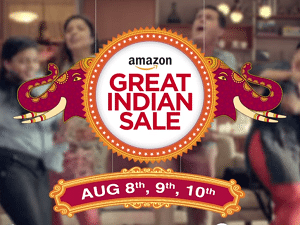 Take the advantage of Amazon Great Indian Sale to save huge money on your shopping. The new year has begun and here is one of the most awaited prequel of sale sessions that will make your mind blow, starting with the stupendous offers by the beloved Amazon.in and later to be provided by various E-commerce. Get ready for this blockbuster Republic Day by shopping and saving loads of money. Amazon always come up with creative offer and deals. It’s way of welcoming the new year is unique. Amazon has announced it’s grand sale with the title ” The Great Indian Sale” and as stated above following its tradition of deals parade for 72hours non stop, this time amazon offering real loot deals with great discounts to be grabbed. Please make your system greased and roll over your mouse with ease and get your favorite products delivered at your doorsteps at the earliest. Get your days booked, please note the dates 8 – 10 August, you will really thank yourself. Also enjoy additional offer by citi bank for its users. Keep visiting CoupenYaari, Happy Shopping. State Bank of India Credit & Debit cards 7.5% cashback on Rs. 5000 (Upto Rs. 1500) till 10th Aug 2016. Additional 2.5% cashback on app. Terms and Conditions. Free Rs. 100 Amazon Gift card on Rs. 1000+ shopping with Amazon Gift card balance. Details here.